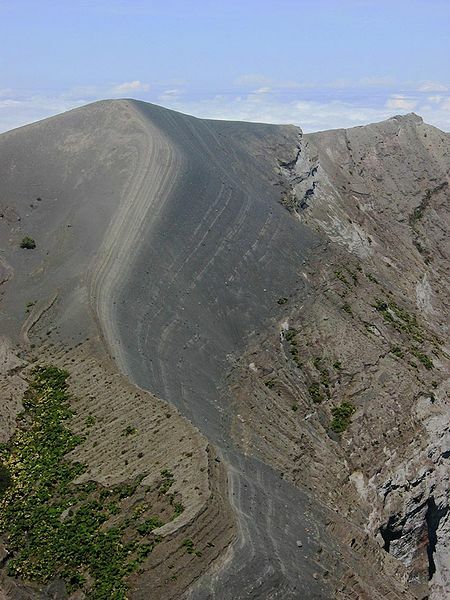 The Irazú Volcano, also known as the Volcán Irazú, is the highest active volcano in Costa Rica. 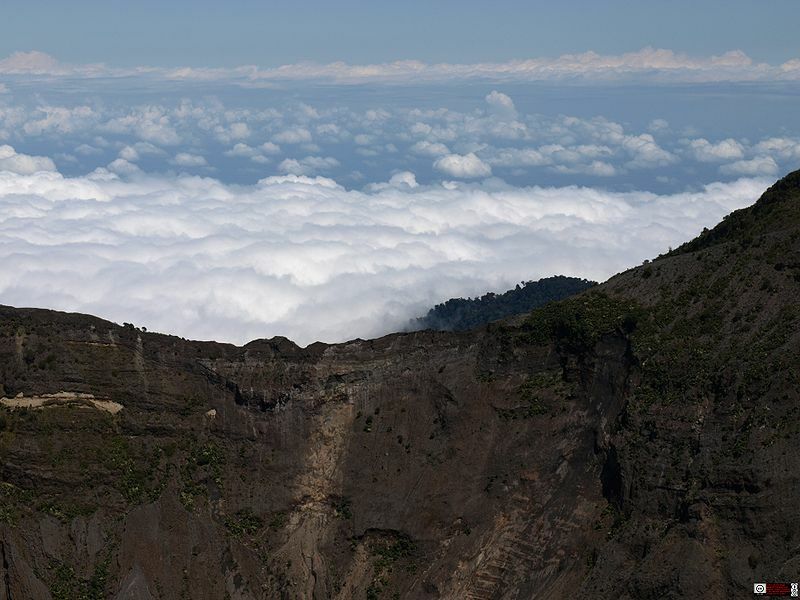 Even though it is approximately 20 miles north of the city of Cartago, the massive volcano still dominates the skyline. Its last large eruption occurred in 1963, but several smaller eruptions (with the latest in 1996) still remind visitors and residents that it is still a force to be noticed. Its 11,260-foot summit includes two primary craters: the main crater that is 3,445 feet in diameter and the Diego de la Haya, which is 1,968 feet across. 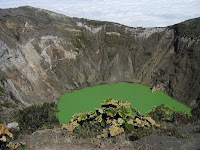 The blasted out, moon-like landscape is dramatic and it includes steep-walled craters, thick vegetation that has adapted to the harsh conditions, and a strange, green crater lake. It also offers views of both the Pacific Ocean and the Caribbean Sea for the lucky few who arrive before the cloud cover blankets the summit. The volcano is located within the 5,705-acre Parque Nacional Volcán Irazú and admission to the park is US$10 (the advanced-purchase rate) and US$15 for everyone else. The park is open daily from 8 a.m. to approximately 3:30 p.m. and it is a relatively easy "climb" since there is a paved road that leads right up to the summit. From the visitor center, there are two marked trails that easily take you to the rim and this overall accessibility is the main reason why it is such a popular day trip for anyone near the city of San José. If you are not arriving with a tour group, there are two general ways to get there: by car or by bus. If you are driving by car, head 14 miles east from San José to the city of Cartago. From there, it is approximately a 20-mile drive northeast through the town of San Rafael and up the mountain toward the entrance to the park. The turnoff is well marked and if you reach Tierra Blanca, you have gone too far. Buses depart daily at 8 a.m. across from the Gran hotel Costa Rica in San José, which is on Avenida 2 between Calles 1 and 3. The roundtrip fare is US$7 per person and the bus departs the volcano around 12:30 p.m. Taxis can also take you there but it can cost approximately US$30 each way. Visitor Center – Located at the crater parking area, this center offers plenty of information about the history and activity of the volcano. Trails - The primary trail is 0.6-miles long and it forms a convenient loop from the entrance road to the lookout points at the craters. There is also a longer trail that takes you even closer. The trails are clearly marked with signs, so make sure to stay on them at all times. 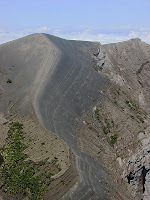 The craters are steep and the rims can be dangerously unstable with very little vegetation to grab hold of in case of a fall. There have been instances where visitors have lost their lives by simply wandering away from the trails for a better view. 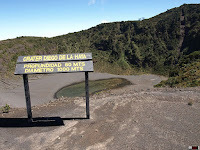 Restaurant Linda Vista – Located at approximately 9,000 feet, its owners boast that it is the highest in Central America. You should at least have a drink there because the view is spectacular. You will also see just about every tour company making a stop there, which can make the restaurant somewhat crowded during peak times. 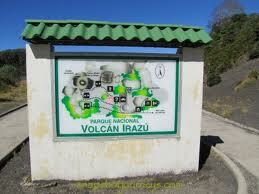 Finally, the best time for visiting the volcano is during the drier months between December and April. The month of February is generally the driest month with the best weather conditions. But no matter what time of year you visit, remember that temperatures at the summit can range between 27- and 63-degrees Fahrenheit. Its average temperature is generally around 45-degrees F, so plan accordingly and always wear layers. For another popular and accessible volcano, check out my post: Exploring the Poás Volcano in Costa Rica! I've been wanting to hike or climb up a volcano for a while now, but never found the time to do so. One thing's for sure, I think I found a great volcano to start with.